Figure A37. Hatteras anomaly, interpreted as the Hateras slab, with (horizontal) [vertical] cross sections through (A)[D] the UUP07 p-wave) and (B)[D] the combined SL2013 and S40RTS s-wave models at 1810 km; C) the location of the modern geological record that we interpret to have formed during the subduction of the slab. 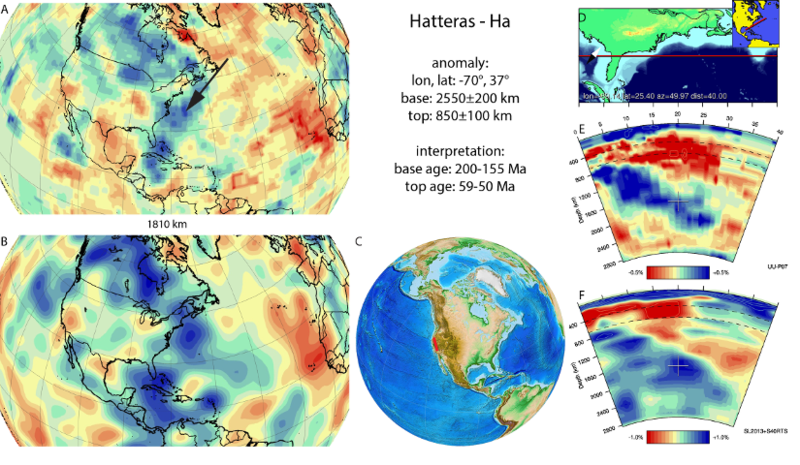 The Hatteras anomaly (Figure A37) is part of the set of anomalies commonly, also in our previous compilation in van der Meer et al. (2010), interpreted as the Farallon slab, initially defined by Grand et al. (1997). It is located below eastern North America within the lower mantle. The anomaly is generally interpreted to represent eastward subducted Farallon oceanic lithosphere (Grand et al., 1997; Bunge and Grand, 2000; van der Meer et al., 2010) below the North American continental margin. The Hatteras slab corresponds to the MEZ and in part the SF1 slab of Sigloch and Mihalynuk (2013), who, based on their interpretation of the geological records of the Wrangellia and Stikinia composite terranes of the North American Cordillera, interpreted the slab to be predominantly intra-oceanic, westward subducted Mezcalera Ocean lithosphere (their MEZ slab) and only a small part Farallon-derived (their SF2 slab). Their pre-100 Ma interpretation, however, is based on a true-polar wander corrected paleomagnetic reference frame without longitude control under the assumption that Africa was longitudinally fixed (Torsvik et al., 2008). Van der Meer et al. (2010) showed that such an assumption leads to major mis-locations of reconstructed subduction zones relative to their corresponding slabs, particularly for the still-subducting Aegean slab, of 1000-2000 km. A much better match between slabs and subduction zones arises with a westward longitude shift, which places the location of the Hatteras slab much closer to the west-North American margin, making a Mezcalera origin unlikely. In addition, Liu (2014) found that westward subduction of Mezcalera oceanic lithosphere would not be able to generate sufficient volume for the slab. One of the arguments supporting that part of the Hatteras slab resulted from intra-oceanic subduction is the mismatch between the reconstructed location and shape of the North American continental margin and the outline of the slab (Sigloch and Mihalynuk, 2013). This occurs mostly towards the south, an area where Sigloch and Mihalynuk (2013) have interpreted the Franciscan intra-oceanic subduction zone, forming the deeper parts of the Cocos slab (their SF1 slab). By extending the Cocos slab and preceding Franciscan intra-oceanic subduction into the deepest parts of the mantle, this would resolve most of the mismatch. The Hatteras slab would then represent (predominant) subduction at the continental margin. Debate exists on the age of onset of continental margin subduction, with estimates varying from ~100 Myr (Grand et al., 1997), prior to 100 Ma (Liu et al., 2008), or since 150 Ma (Sigloch et al., 2008). In the interpretation of Sigloch and Mihalynuk (2013), the intra-oceanic subduction zone was overridden by the continental margin, followed by initiation of Rocky Mountain deformation, recorded by synorogenic clastic wedge (160–155 Ma), which we adopt as minimum age of start of subduction. Tectonic studies (Ward, 1995; Nokleberg et al., 2000; DeCelles et al., 2009), however, suggested that subduction at the western margin of North America (then part of Laurentia) initiated earlier, from the Early Jurassic onwards. Consequently, van der Meer et al. (2010) interpreted the base of the slab as Early Jurassic. Magmatism in the Sierra Nevada batholith started at ~200 Ma (DeCelles et al., 2009), which we adopt as the maximum age of the base of the Hatteras slab. Towards the top of the lower mantle, the N-S trending Hatteras slab ceases to exist and is replaced by the NW-SE trending SF3 slab of Sigloch and Mihalynuk (2013). This happened after the South Farallon trench steps westward following accretion of the Shatsky Rise Conjugate plateau, and a slab window formed leading to Sonora volcanism including the Tarahumara ignimbrite province (Sigloch and Mihalnyuk, 2013). The volcanic rocks and granitic plutons were dated by González-León et al. 2011. The age of the Tarahumara Formation is between ca. 79 and 59 Ma; the monzonitic to granitic plutons have ages of ca. 71–50 Ma (We have adopted 59-50 Ma as the end of subduction of the Hatteras slab.